Following is my response to Michael Horn's "rebuttal" to my interview on The Generation Why podcast, which he published on his website on Aug 23, 2015. I have divided this article into 5 sections, each section demonstrating the various methods or tactics Michael Horn employs while trying to defend his claims. "Special thanks once again to Mahigitam, whose diligent scouring of the news uncovered the information." "Once again the ever resourceful Mahigitam.."
"Our thanks again to the ever-vigilant Mahigitam for bringing this information to our attention." "Thanks once again to Mahigitam for pointing this corroborative information confirming Billy Meier’s prophetic scientific accuracy." If it was made possible for you to come to the US to speak as a scientist on the authenticity of the Meier case, would you be willing to do? Do you think you have enough credentials to be taken seriously at such an event, etc. What could be the reason behind this sudden twist of events? Why is he calling me a defamer,..etc now, whereas a little over a year ago he was commending me for my "work" and even offered me to come to US and give a presentation there 'as a scientist' on Meier case? As mentioned in my interview on The Generation Why podcast, based on the claims made by MH, initially I thought that he, claiming to have been researching the case for more than 3 decades, has access to all the publications of contact notes and that he also verified the authenticity of the alleged prophecies and predictions. But later, through my personal investigation that took years of persistence, I have come to find out that MH had not only has no access to older contact notes publications on which he based his most if not the "best" prophetic and predictive corroborations but he has done no such verification at all. In addition, my research yielded ZERO genuine prophecies and predictions that withstands scientific scrutiny. Not to mention several dozens of examples supporting the hoax hypothesis (ex: retrodiction, backdating, editing, etc.). It was at this time that I wanted to verify the Meier's alleged fulfilled-prediction on the cause of death of the 5,100 year old Ice man also called Otzi, which MH says is an "irrefutable fact" and has been promoting so fervently as the evidence that in MH's own words 'Proves Meier UFO Contact Case True' and thereby demanding the $1,000,000 from James Randi's paranormal challenge. When I found out that Meier has published no such prediction before the discovery on the cause of death (Arrow) was made by scientists in July 2001, I decided to share it with Michael Horn hoping that he would acknowledge it and retract his corroboration article which is a total misrepresentation of the facts. - me 'accidentally' (according to MH) revealing my "evil" intention to 'deconstruct Michael Horn'. This is a gross misrepresentation of what I stated at that time (2014) in a lengthy PRIVATE conversation with a friend of mine on facebook. Instead of obtaining clarification from my side regarding my PRIVATE chat (which he obtained somehow and shamelessly published openly for all to see on different facebook groups), he cherry picked what he wanted and has weaved a nonsensical story around it that fits his narrative. The fact of the matter, which I have already clarified at that time, is that in my PRIVATE conversation I stated to my friend that I would be deconstructing MH's illogical claims. It is completely dishonest of MH to resurrect this old hat now, despite me making it clear for him nearly a year ago. - many people were dismayed that I have solicited Meier material in the form of books, photos, documentation, etc. under the guise of wanting to “archive it for the future”, when my actual agenda may be a bit more profit oriented than that. This again is a baseless claim. As I stated in the interview, in the beginning I had mostly positive views towards the case. It is at this time (2012) that I created a blog with the intention to archive the Meier material irrespective of it being pro or con. My intention was to provide both sides of the case to the readers so that it would help them in their personal investigations. Later towards the end of 2012, when I decided to dig deeper into the case, I have put up a donation request (see below) on my blog stating that I am seeking donations in the form of money or publications that help me with my research. "Some of my research or investigations into the Meier case & presenting the related information for you on my blog requires purchasing books, magazines, DVDs,..etc, which I cannot always afford. So i need your valuable donations which would only be used for Meier case study & sharing information and these will not be used at all for personal use." Of course for a person like MH who excels at throwing personal insults and has the intent to do so, nothing will stop him from labelling others as profit-oriented even though he has no shred of evidence at all to back it up. It's really ironic because he is now making the same baseless accusations on me, as others often make on him regarding which he laments a lot. For the record, I have never made such accusations, either to Michael Horn or Meier which I also made clear in my interview. MH claims that I have 'conspicuously avoided' talking about the categories of evidence - like photos, videos, metal samples, witnesses, etc. - other than space pictures and prophecies/predictions in depth. This, according to MH, reveals my negative intentions. Once again we have MH either deliberately twisting information to suit his needs or he is simply incapable of having reasonable thoughts. Me and the host of the podcast The Generation Why, have agreed to talk just about my research into the space pictures and the prophecies/predictions. He explicitly informed me to just pick one example from each of these two categories and mention them on the show. "Mahesh Karumudi..explains his findings on Meier’s claims of space images purported to be taken from spacecraft, predictions on the age and manner of death of the iceman known as Otzi, and more." Regarding the other categories of evidence, no matter how much MH wishes and tries to promote them as 'indisputable' and 'best', at the end of the day from a scientific perspective they can only regarded as INCONCLUSIVE evidence. Since the current discussion is about the claims I made in my interview, it is inappropriate to address other irrelevant topics, which may distract or confuse the readers. MH: "All that he could now claim is that I didn’t answer his agenda. But the facts are such that there is no evidence that Meier has ever falsified anything. That there may have been other parties stealing, manipulation, falsifying evidence has actually long been known, stated, and has indeed been a problem. But it’s real life problem." Method #3 - Denial or Ignorance or both? Now lets get into the meat of the matter which is the discussion about the prophecies and predictions. MH points to the following three links and claims that the examples documented in them serve as evidence of Meier’s prophetically accurate information. According to MH, Meier first published the fact that Mercury is a shrinking planet in CR 66 in 1976. But as it turns out, it was already revealed in 1974 by NASA’s Mariner 10 spacecraft. Clearly, the information is talking about a WAR started by Russia from Arkhangelsk. Obviously such a war has never been started. Case closed! Somehow MH manages to see Russian troop movements to Arkhangelsk as a strong corroboration of the information in these verses (also see this article by Michael Horn from 2011), completely failing to see the context and ignoring the long history of Arkhangelsk of participation in several wars or battles through out the centuries, it’s close proximity to the arctic circle with all it’s resources the countries around it try to get their hands on etc. The 2011 news article which MH cites as corroboration, also mentions places other than Arkhalgelsk - 'Murmansk..or other areas' - to which Russian troops 'could be' sent. So essentially Meier would be "right" if he picks up any city (which are many) that has a military base or naval station along the northern Russian border - which is the reason why it belongs to the list of weak predictions but apparently not in the world of MH. MH also adds: "In the same document, the Henoch Prophecies, Meier predicted the WTC attack, the Ebola epidemic, the fall of France to radical Islam, etc. He first foretold irrepressible worldwide Islamist terrorism in 1958, then again in 1981, 1987 and 1995 (and more about the WTC here)." And of course he doesn't tell you the FACT that all this information was only published after the events have taken place. However there is no evidence that it was indeed published by Meier in 1958 and it was only for the first time (re?) published in 2005. 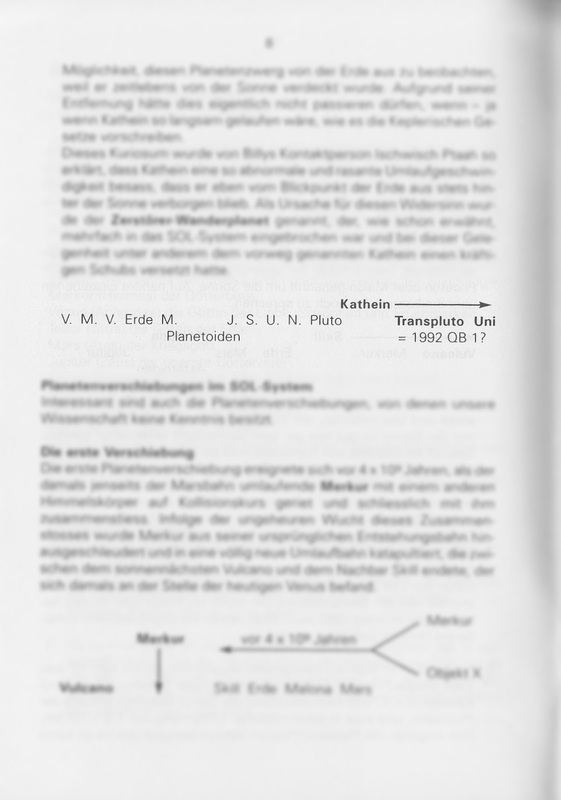 The 1978 publication MH is referring to it is the book ‘Existentes Lebens im Universum’. However this book was only first published in 1993. The copyright date does indeed say 1978/1993, but only some excerpts have already been published before in Meier's periodical Stimme der Wassermannzeit (SWZ) between 1981 and 1984. The information on the planets beyond Pluto is not in those excerpts. Even though this information has been made aware by me to MH long back, which he even mentions on his own website, he still continuous to misrepresents the facts. This reveals MH's widespread ignorance and misrepresentation of Meier's publications and the years in which they are published. "Then he (note: Meier) stated that there are also two more planets orbiting our sun - both beyond Pluto, and both smaller than Pluto. One of them is quite a ways beyond. He said that it was not the time for us to discover these bodies technically yet, but that they would be identified and studied in the future." The idea that there could be other planets beyond Pluto is many decades old. A 10th planet has already been strongly suspected to exist beyond Pluto between the years 1930 and 1985, decades before Meier talked about it. This hypothetical planet was labeled Transpluto. So this very general information of Meier is in line with the scientific expectations of that time and can hardly be called iron clad evidence for extraordinary foreknowledge. 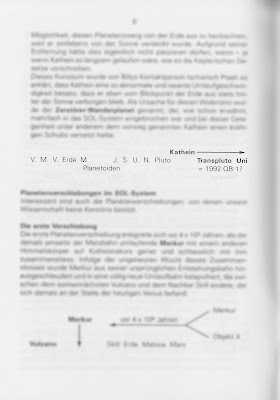 In Contact Report 241 (February 3, 1992), Transpluto and another supposed trans-plutonian planet called UNI are briefly mentioned. In FIGU Bulletin 9 (November 1996) Meier refers to this contact and additionally mentions that UNI has an orbital period of 3,600 years. Also he says he has not been given further information. An English translation of this part of Bulletin 9 was published by MH on his website, along with information of Sedna (a dwarf planet discovered in 2003, whose size is smaller than Pluto and has an orbital period of 11,400 years) as a corroboration of Meier’s info. Since UNI supposedly has an orbital period if 3,600 years, Sedna would then be Transpluto. However in the FIGU periodical ‘Voice of the Aquarian age’ 128 (2003), page 7, FIGU co founder and core group member Guido Moosbrugger provided several graphical representations of all known and unknown planets' locations, in which the orbit of Transpluto is shown to lie between Pluto and UNI. And according to Kepler's 3rd law (which in simple terms states that the planets that are far away from the Sun have longer orbital periods than those close to the Sun and that they move more slowly around the Sun), the orbital period of Transpluto should then be smaller than that of UNI (3,600 years). But Transpluto aka Sedna, as already established before has an orbital period more than three times that of Sedna (11,400 years), which is a contradiction. In the same article Guido Moosbrugger links Transpluto to another body called 1992 QB 1, although he states: "whether it really is Transpluto, I cannot judge." Since Guido is close to Meier he could always have asked him, so it seems Meier also doesn’t know, which was also stated by Meier in FIGU Bulletin 9. But 1992 QB 1 is a body of only 167 km in length, which is far to small to qualify as a dwarf planet, let alone a planet. In the meantime many trans-plutonian bodies have been discovered like Eris, Makemake, Haumea, 2007 OR10, 1992 QB1, etc. Recently in Januray 2015, scientists even indicated that there could be two planets beyond Pluto that are larger than Earth. The fact that Meier mentioned only mentions 2 trans-plutonian bodies, which were in more or less in line with the scientific expectations at that time, rather than the many that have since been discovered, rather raises suspicion about Meier’s claims of foreknowledge than it raises confidence. In conclusion, Meier’s claim of foreknowledge of Transpluto, which is nothing more than that a planet beyond Pluto exists which is smaller than Pluto, is completely unfalsifiable and could be linked to any trans-plutonian body with an orbital period smaller than 3,600 years. Regarding UNI, apart from it also being smaller than Pluto the only specific piece of information Meier provided is an orbital time of about 3,600 years. None of the dwarf planets discovered so far has an orbital period of about 3,600 years. So how could Michael Horn claim this information has been corroborated? Can YOU, MH, give us the terrestrial names of the planets that match with Meier’s predicted planets Transpluto and UNI that you say have been discovered after the year 2000? Few, who might think that if MH would have been made aware of the above information, he would have retracted his "IRON CLAD" claims couldn't be more wrong. I have, months ago, shared all of the above information with him and yet we still see him pushing the above examples as "IRON CLAD." This brings us to the original question being asked above - Is MH ignorant or in denial or both? I will let you make your own judgment. Method #4 - MORE Denial or Ignorance or both? MH: "At about 10:21 Mahesh refers to fulfilled prophecies saying "the information has already been known before, published in newspapers, journals, magazines and other places as well…" but he fails – despite this wonderful opportunity – to state even one such specific, previously known example." I am dumbfounded by this since one of the two main reasons I was invited on the show is to talk about Meier's prediction on 5,100 year old Iceman. And as planned I did talk about it by giving three examples not only showing that Meier's information on Iceman already has been known before but also showing that he likely have copied from terrestrial sources like newspapers or journals, etc. MH: "Many times he’s tried this ploy, saying that some scientists somewhere came up with “similar” information or a theory…but he always fails to actually show the means, motive and opportunity for Meier to have acquired and/or plagiarized this information – especially during the pre-internet age." MH continues to fail to understand a simple concept as the burden of proof, which is always on the one making the claim. His claim, on which he rested his entire case of prophecies and predictions, is that since Meier had no access to scientific information, then the only alternative according to MH is that he must be getting his information from ETs. But I have demonstrated with absolute proof that indeed Meier has access (means and oppurtunity) to scientific information there by disproving his claim. I never stated that Meier deliberately purchased the scientific publications, etc. and copied them into his contact notes as MH claims. MH: "He also fails to note that Meier never published “theoretical” information or scientific information that was later proven to be incorrect. Never." Another example demonstrating his, sadly, extreme stage of denial or ignorance. I have documented dozens and dozens of such cases on my website. Let's not go any further because once again we have the Meier's Ice man prediction to serve us as an example, which I have clearly explained in the same interview to which MH is responding now. Meier, in 1992, first published that Ice man was left alone in the ice storm to die (implies hypothermia), who already fell from some height due to an epileptic fit. But when scientists discovered that an arrow was lodged in his back in July 2001, the verses were edited and the ARROW cause was inserted in later publications. Same is the case with the age of the Ice Man's corpse. Meier, in 1992, first published that age of Ice man's corpse is around 4,105 years but when scientists few weeks later using latest equipment announced the accurate age as being between 5,100-5,300 years, Meier changed it accordingly from 4,105 years to 5,105 years. MH: "At around 13:00, we’re treated to Mahesh referring to Kal Korff as a source of credible information against Meier! And Korff is the guy that Mahesh is citing as credible." "Somebody, who already know about Korff might say that he is a very controversial figure and that we shouldn't trust what he says. And for those, I say, you may be right. But see..and again the evidence corroborating Korff's information comes from none other than Meier and Michael Horn themselves." MH: "Other things are most likely exactly what Meier has said they were, occasional errors here and there in transcripts – which span 26,000+ pages and which, for a number of reasons couldn’t have been backdated deliberately by Meier. It should be remembered that Meier published and disseminated his Contact Reports in German, beginning in 1975, and which later found their way into other languages. As previously stated, I had very early English translations. For Meier to have been "backdating" this material, he would have had to run around and get all the paper copies, in at least two languages, and start an impossible task that even today in the electronic age would be just about impossible." MH: "So Mahesh is saying that Meier would need to know how to fake photos, have the equipment, etc., for which not a shred of evidence exists. He’s also saying that the photos were faked." Absolutely not. I was simply talking about the lesser degree of certitude of common people when looking at the conclusions of the experts based on their analysis of different types of evidence in Meier case, other than prophecies/predictions. MH: "And when he states that there were no other photographers, the fact of the matter is (as is stated on page 449 in the Supplementary Report when Stevens refers to page 134 and ensuing pages in the Preliminary Investigation Report,) that four different people photographed the same UFO, on four different cameras, the photos being developed in four different labs (one in another country)." I don't remember making this argument at all. But anyways, the fact of the matter is that the photos from the above event are taken at night and just show some "lights/fireworks" in the sky. MH: "Mahesh also infers that Meier could have faked the photos because he controlled the camera, film, etc. However, Wendelle Stevens and the investigators once loaded Meier’s camera with their own film right before he went out on a photo shoot of the craft. They also had it developed and the results were…a full roll of UFO photos." "Did Meier hoax his supposedly “genuine” space and time travel pictures, at least some of them? It is an indisputable fact that there are several dozen obvious fakes in Meier’s collection of space and time travel pictures and even among the relatively recent (~2001) ET-authenticated 42 pictures. Even though the convergence of all the cumulative evidence so far discussed, beyond a reasonable doubt, apparently point to Meier as the perpetrator behind these crude hoaxes, one can’t prove with certainty that Meier himself did it." Just finished reading your "rebuttal", if one could call that. I will respond to it soon. For now can you cite the source for your following claim made in the article? "However, Wendelle Stevens and the investigators once loaded Meier’s camera with their own film right before he went out on a photo shoot of the craft. They also had it developed and the results were…a full roll of UFO photos." My source was…Wendelle Stevens himself. Since I was personally in contact with him for over 20 years, as is the case with Lee and Brit Elders, snce I have personal experience with them - which of course you don't - I happen to have learned things directly from them, which of course you didn't. So, are you saying that all you have is an anecdote? If Meier really shot photos of UFOs using the film loaded by Wendelle himself, then it must have been documented by Wendelle-Lee team somewhere in their books along with the photos. Didn't Wendelle ever present or provide you these photos ? Where are these photos? Are they with Meier? Have they ever been seen by anyone? So you're calling me a…liar? No, not at all. I just wanted to confirm whether what you stated is just an anecdote or evidence that has been documented and published. The way you presented your claim in your article suggested that there really was evidence to back it up. But now you seem to be saying that all you have is an anecdote. So you have zero evidence to support your claim. It seems you have no idea where and when these photos were taken. Also it seems you have no idea in whose possession, these UFO photos are right now. And most of all, it seems you haven't seen them at all? Pardon me for laughing out loud at the irony of someone who has zero personal experience, evidence, on-site investigation, contact with any of the principles, etc., who's trying to impugn my - and their - integrity and credibility! Thanks for "answering" my queries. That is all I need to know. MH's claims are strange and at the same time very suspicious because his statement implies that in all these decades since the 1970's both Wendelle Stevens and Lee Elders and even the rest of their research team for some reason decided not to share or publish the most astonishing and conclusive part of their investigation into the Meier case but one of them (Wendelle Stevens) apparently shared it only with Michael Horn who happens to reveal it only after Wendelle's death and as a defence against my skeptical argument (that Meier never invited journalists or scientists and took photos using their camera or film at a prescribed location within a given time) made in my interview. Even though I never met any of the original investigators in person, I have had some mail contact with Lee Elders (regarding the CIA claims Wendelle Stevens made in his presentations and others), whom I asked to corroborate this incident. As it turns out my suspicions were right. Hope you and Brit are doing fine. I have read all of the books and watched all the documentaries you and your team published on the Meier case. But I haven't come across this incident as stated by Michael Horn nor have I seen any such beamship photos supposedly taken by Meier. Did this event, as mentioned by Michael Horn, ever took place? Hi, we're doing great and have our hands full with other projects of interest. What Michael Horn has eluded to is simply not true. We never loaded Meier's camera with our own film nor did we ever have any of his film developed. So, considering Lee's response and all the other issues discussed so far in this article, would I call MH a liar? Well, I will let you make your own judgement. [I received the following mail on Aug 26 from a person (name withheld according to his wish) who closely worked with Wendelle Stevens and whose name was also mentioned in Wendelle Steven's book - Preliminary Investigation Report - published in 1982. This Michael Horn is quite a number. I was probably one of the people who corresponded most heavily with Wendelle about Meier - both by snail mail and phone - and I never heard once mention the name Michael Horn. Wendelle told me things off record but there was never any claim made that he personally gave film to Meier, that Meier went off and came back with photos. That is sheer nonsense. Wendelle would have told me if such a thing had occurred. I think I have addressed almost all of Michael Horn's counter arguments. If any were left, then it is only because either the evidence speaks for itself clearly for a reasonable person or that the claims must be too stupid to even comment upon. It’s true that sometimes people do not want to engage their ‘opponents’, because they know their case is weak. Another reason can be that people do not want to engage their opponents because they are so utterly incapable of having a reasonable discussion with, or their arguments are so ridiculous, any attempt to do so is futile. I hope the content of this article makes it abundantly clear which of the two reasons made me decline the invitation to debate MH on a radio show, especially when the host of that shows seems to be unfamiliar with skepticism and critical thinking. Nevertheless, I made it clear to MH that I am willing to debate him, if very strict agreements are made on what exactly is up for debate, which needs to be specific and restricted enough in order to have a meaningful debate and a host/moderator is available who is able to recognize when gross logical fallacies, ad hominem attacks etc. are committed and is capable enough to intervene when that happens.